Did you notice the dragonfly’s head is turned upside-down? That reminds me of the movie Beetlejuice (1988). Happy Halloween! All three photos show the same Sable Clubtail dragonfly (Stenogomphurus rogersi), perched alongside a small stream located in Fairfax County, Virginia USA. This individual is a male, as indicated by his indented hind wings and terminal appendages. Notice his head is upside-up in the last two photos. Related Resource: Cobra Clubtail head-tilts, featuring a female with her head positioned nearly upside-down. I guess the upside-down head thing is characteristic of some members of Family Gomphidae (Clubtails). Please help me fix a flawed favorite photo. 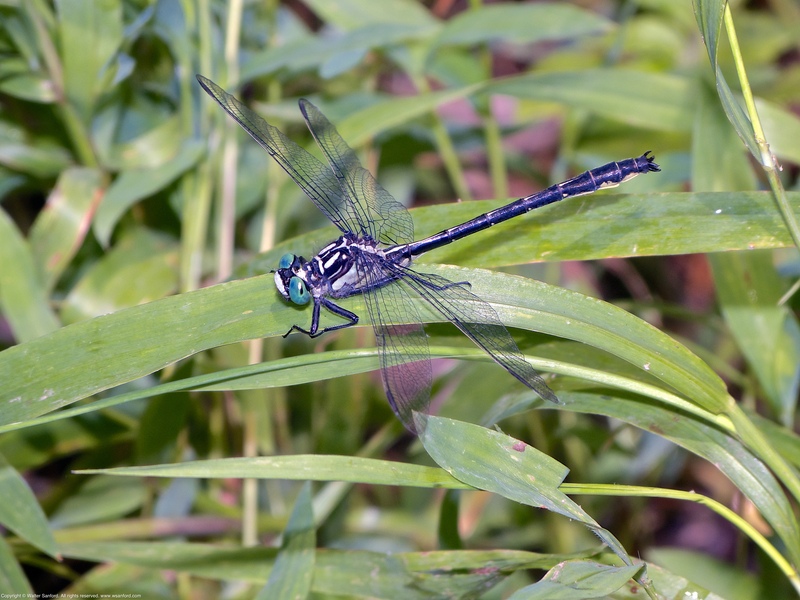 The following photo is one of my favorites from a set of 101 photos of Sable Clubtail dragonflies (Stenogomphurus rogersii) that I shot on 08 June 2018. Problem is, the photo is flawed by “hot spots” on some of the vegetation shown in the picture — those brighter areas in the photo tend to distract the viewer’s eyes from the subject. I’m not sure what caused the hot spots. The vegetation was still wet from a rain event the night before. Perhaps the brighter areas were caused by the interaction of water on the plants with both ambient sunlight and the light from an external flash unit mounted on my camera. I am convinced it should be possible to use the photo-editing tools in Adobe Lightroom and/or Adobe Photoshop/Camera Raw to fix the hot spots. Easier said than done. Every time I have attempted to “get ‘er done,” the work session ended quickly with me feeling like my head was going to explode! Generally speaking, I’m opposed to “Photoshopping” wildlife photos. In this case, the edits I’d like to make won’t affect the subject so I’m OK with tweaking the photo to improve upon nature. I have watched several video tutorials on YouTube that suggest the repair process should be relatively simple and straightforward. What am I missing? PLEASE HELP ME! Step-by-step directions would be ideal. Alternatively, a pointer to a good “how to” video would be welcome. I was sitting on my Coleman camp stool, looking down into a shallow stream channel where I spotted my first Sable Clubtail dragonfly earlier the same day. 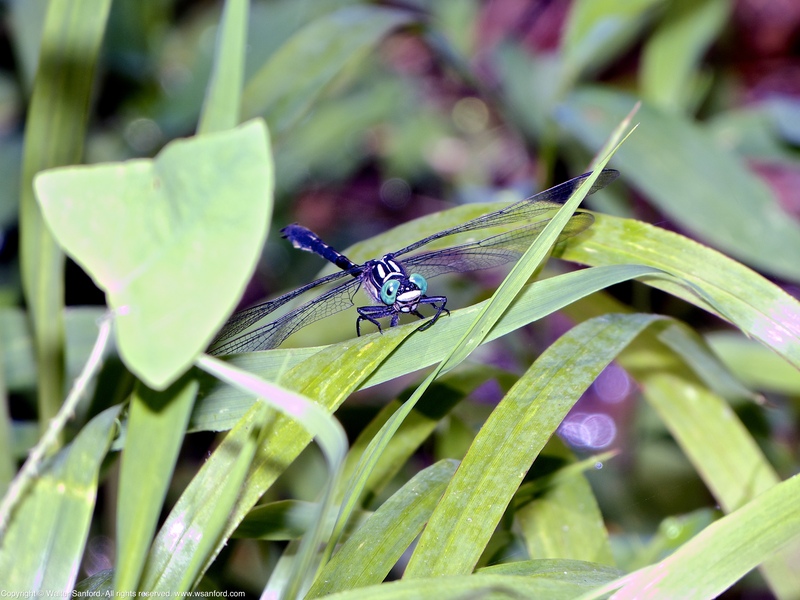 The dragonfly landed on vegetation near the top of the channel, perched almost vertically with the tip of his abdomen pointed toward the creek. The unusual position provided a good view view of the dragonfly’s face. 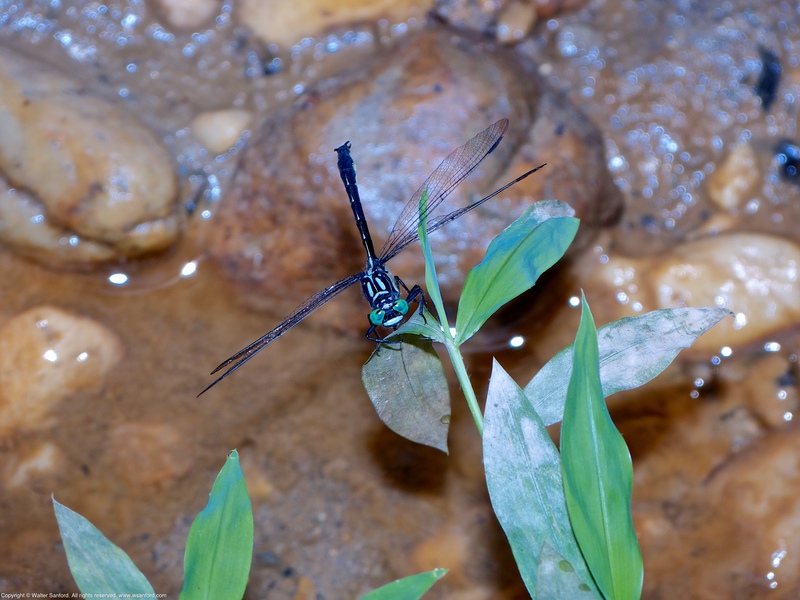 A Sable Clubtail dragonfly (Stenogomphurus rogersi) was spotted perched alongside a small stream located in Fairfax County, Virginia USA. This individual is a male, as indicated by his indented hind wings and terminal appendages. 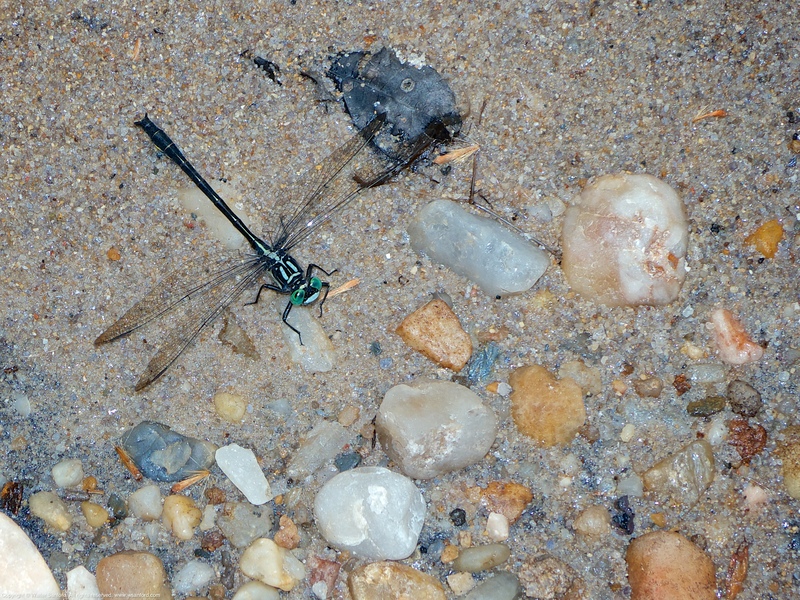 Notice the dragonfly is eating another insect. I called the meal lunch, since the photograph was taken at approximately 12:30 p.m. I took a deep dive into the archives of my Sable Clubtail dragonfly (Stenogomphurus rogersi) photographs and found some buried treasure! 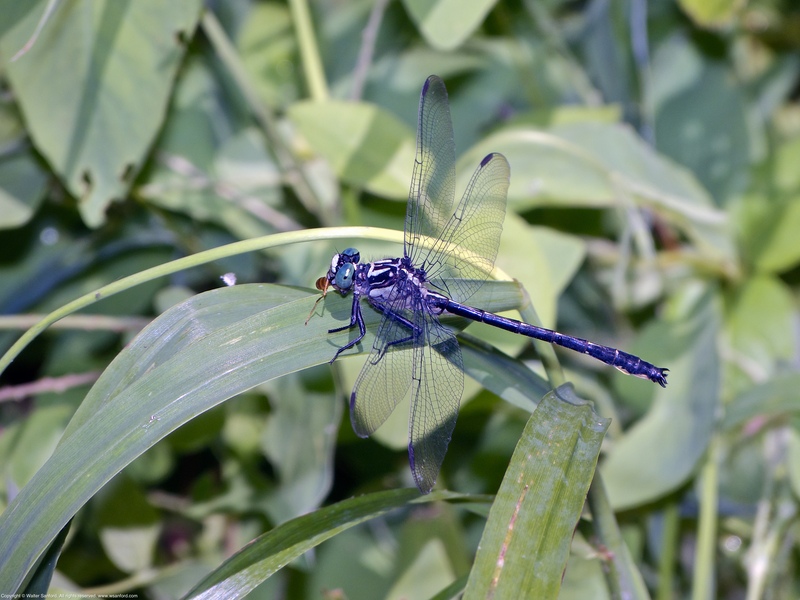 The photographs in this gallery were lost in the excitement of my rediscovery of Sable Clubtail in Fairfax County, Virginia USA, when I rushed to select and publish a few representative photos from the set taken on 08 June 2018. 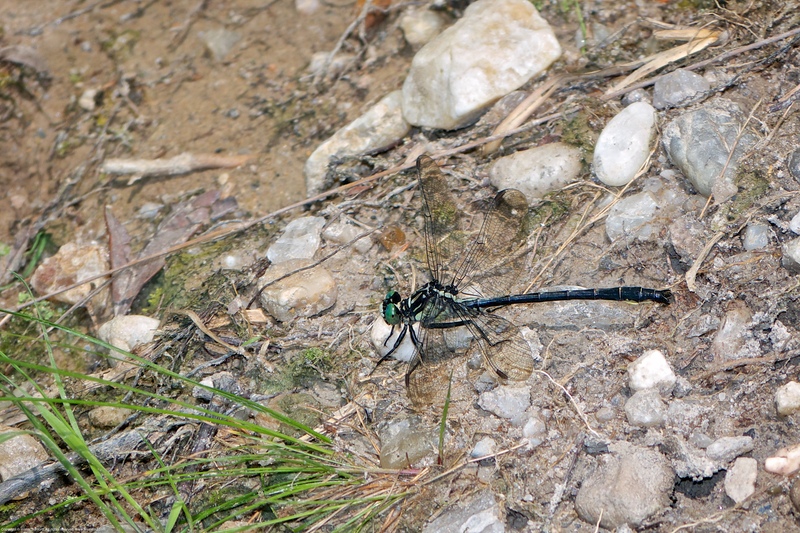 As you can see, Sable Clubtail perches on the ground sometimes, similar to other species of clubtail dragonflies. 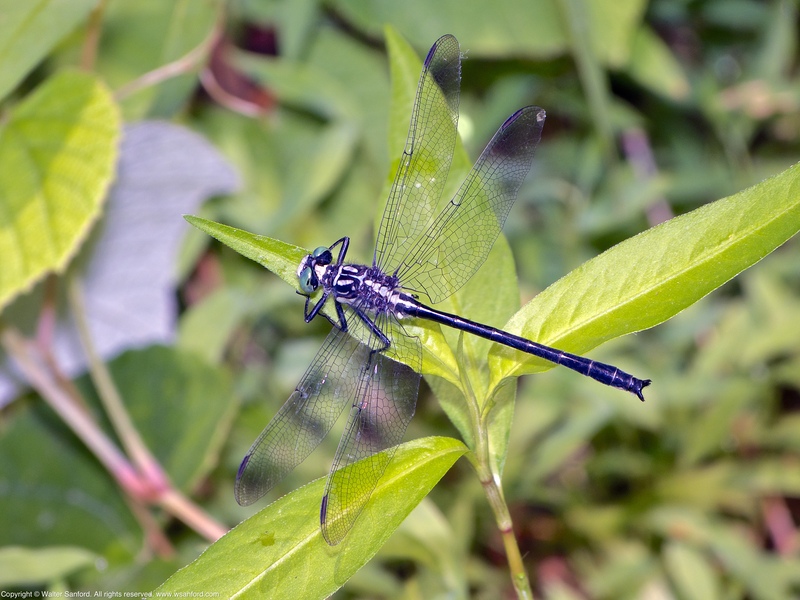 One, possibly two Sable Clubtail dragonfly (Stenogomphurus rogersi) was/were spotted perched alongside a small stream located in Fairfax County, Virginia USA. All individuals featured in this photo set are male, as indicated by their indented hind wings and terminal appendages. The first shot is a “record shot,” that is, a quick-and-dirty shot that provides a record of the spotting. In this case, I was able to shoot one photo before Male 1 flew away. I didn’t see where he landed. 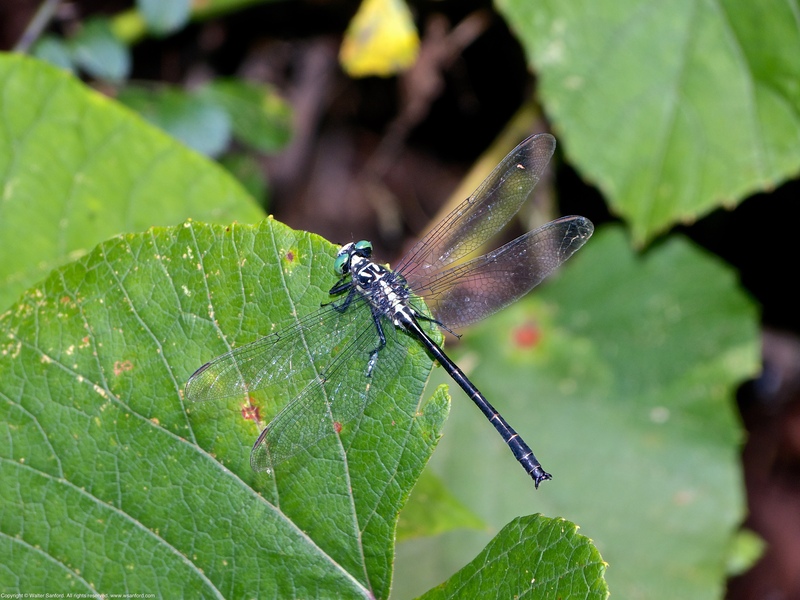 I found Male 2 perched on overhanging vegetation along a nearby cut bank in the stream channel. Notice the prominent peach-colored schmutz on the right forewing, located near the pterostigma, that is visible in both photos of Male 2. Since I don’t see the schmutz in the photo of Male 1, I think Male 1 and 2 are probably different individuals. Dr. Edward Eder and I visited the same site on the same day. Dr. Eder is one of the best all-around amateur naturalists I know. Ed saw/photographed a male Sable Clubtail near the same location as my photos, a little earlier in the day. Both of us thought we’d set a new late-date for S. rogersi in Northern Virginia. 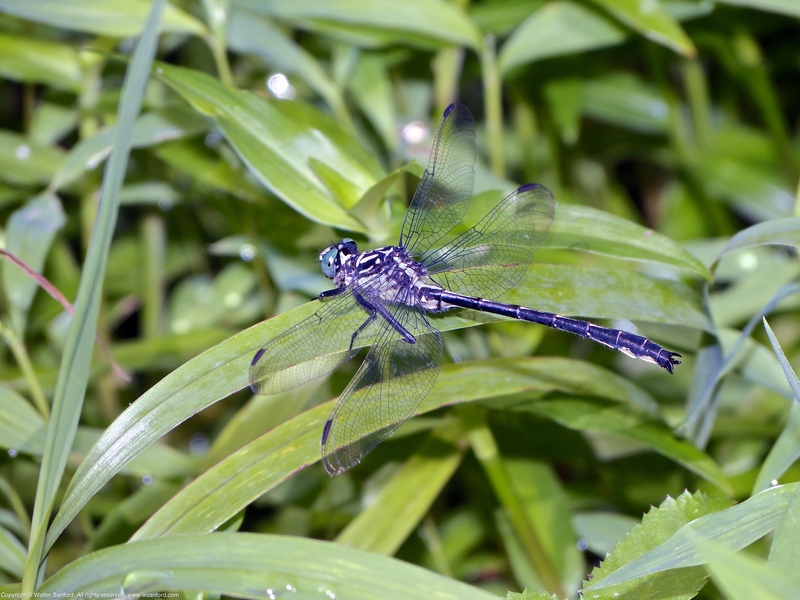 As it turns out, I spotted a female Sable Clubtail on 05 July 2018. Photos of the female will be featured in my next blog post. The ode-hunting off-season is used by the author for experimenting with new photography gear and techniques, studio photography (mostly odonate exuviae), and researching/exploring sites for finding new species of dragonflies and damselflies, especially rare to uncommon species. 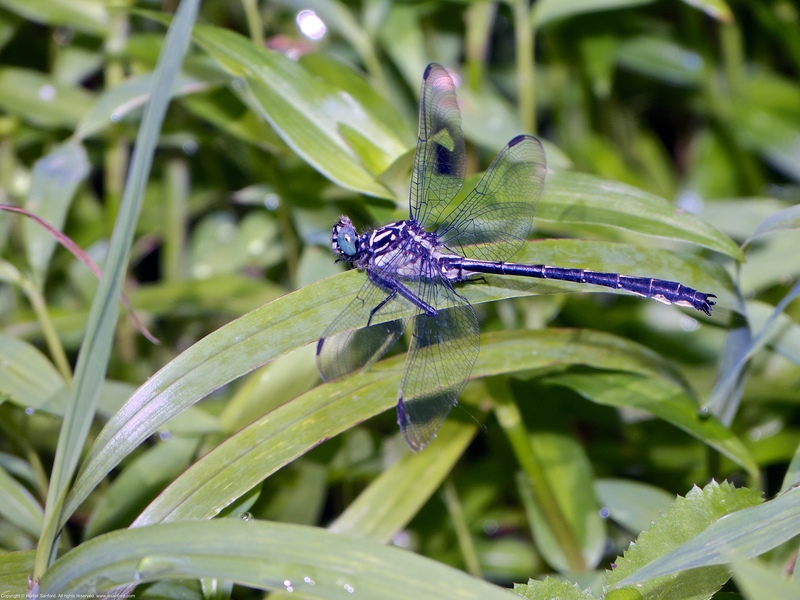 During Winter 2017-2018, Google Earth/Maps was used to virtually explore potential sites for Sable Clubtail dragonfly (Stenogomphurus rogersi). 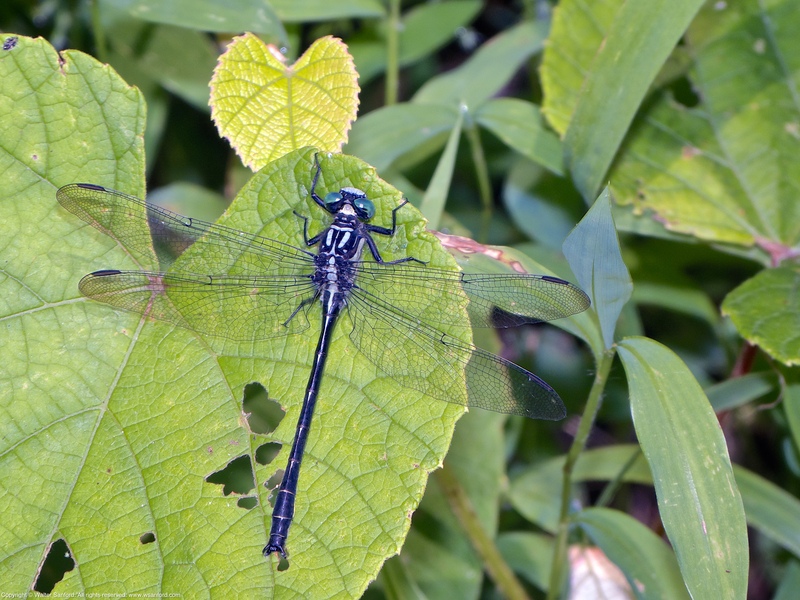 A location where Sable Clubtail had been spotted by Kevin Munroe, former manager of Huntley Meadows Park, was rejected as practically inaccessible. 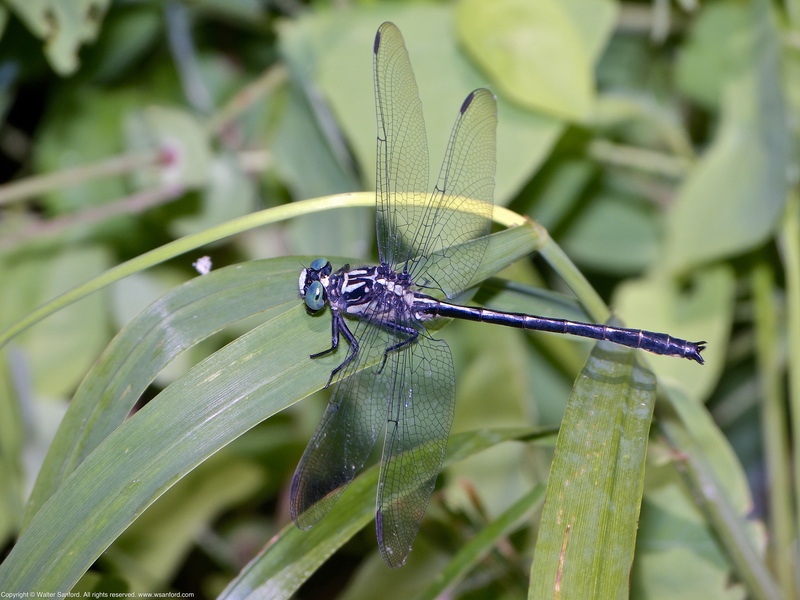 I recalled seeing Sable Clubtail on a species list for one of several sites surveyed regularly by a group of volunteers coordinated by Jim Waggener, in association with the Audubon Society. I contacted Jim and asked for information regarding sightings of S. rogersi by the survey group. Jim sent an e-mail to all members of the group; Bob Blakney kindly responded by sending a photograph and guidance for finding the location where his photo was taken on 08 June 2012. 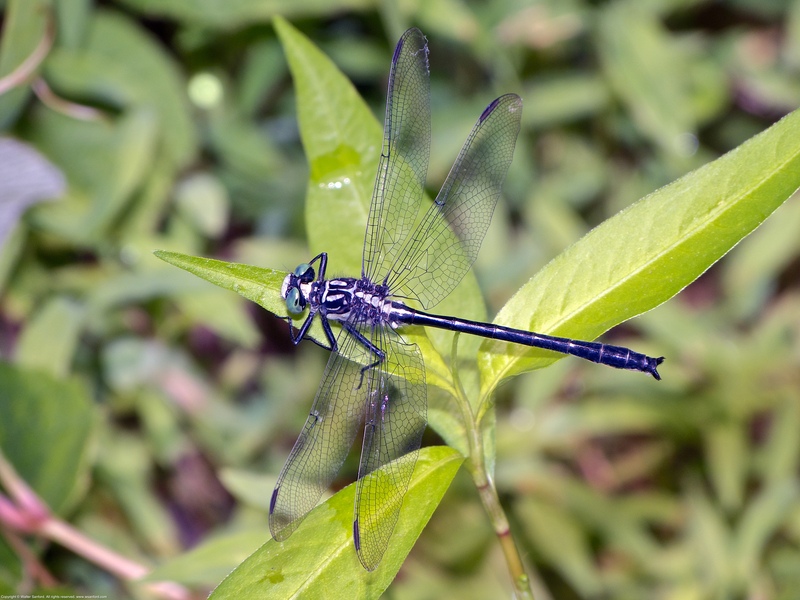 As it turns out, only one Sable Clubtail was seen by the survey group in 2012 and that was the last sighting of the species for the next six years. I speculate the gap in sightings might be explained by the fact that scheduled dates for site surveys by Jim Waggener’s group didn’t coincide with the limited adult flight period for Sable. I scouted the site for the first time on 01 December 2017. Fred Siskind kindly provided guidance that helped to focus the search area. I started actively hunting for Sable Clubtails beginning in mid-May 2018. 04 June 2018 was my last fruitless search. The off-season homework paid dividends for the first time on 08 June 2018. 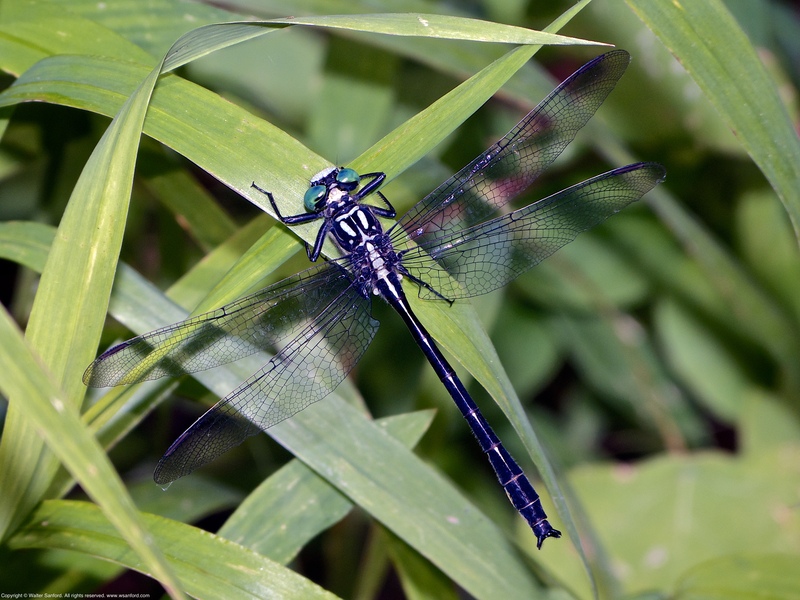 Several Sable Clubtail dragonflies were spotted perched alongside a small forested stream located in Fairfax County, Virginia USA. All of the individuals featured in this post are male, as indicated by their “indented” hind wings and terminal appendages. 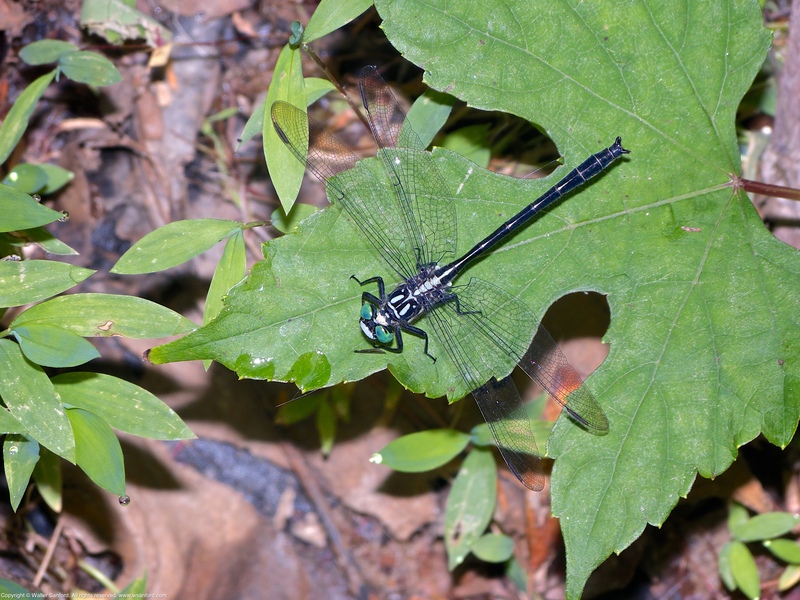 Sable Clubtail has a limited range and is classified as a rare to uncommon species of odonate. The following map shows all official records for Sable Clubtail in the United States of America. Source Credit: Abbott, J.C. 2006-2018. 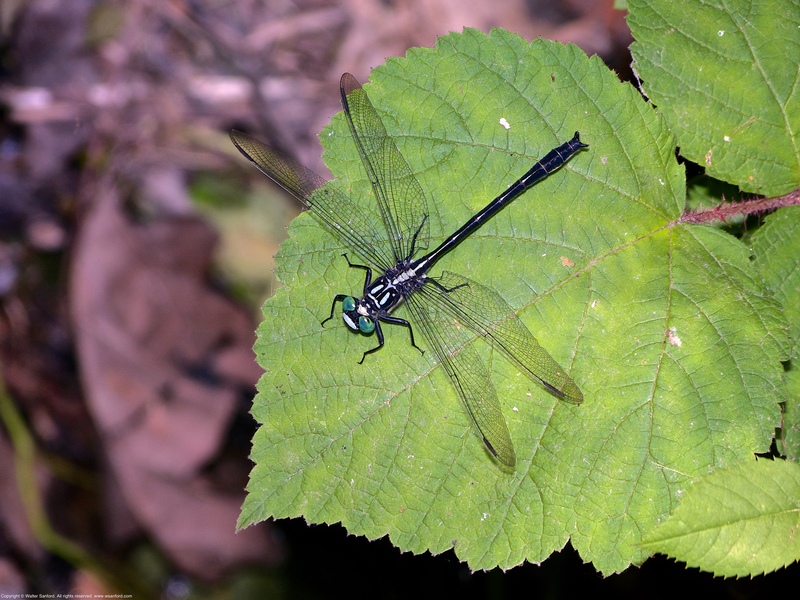 OdonataCentral: An online resource for the distribution and identification of Odonata. Available at http://www.odonatacentral.org. (Accessed: June 11, 2018). Key: blue dots = Dot Map Project; green dots = Accepted records; yellow dots = Pending records. 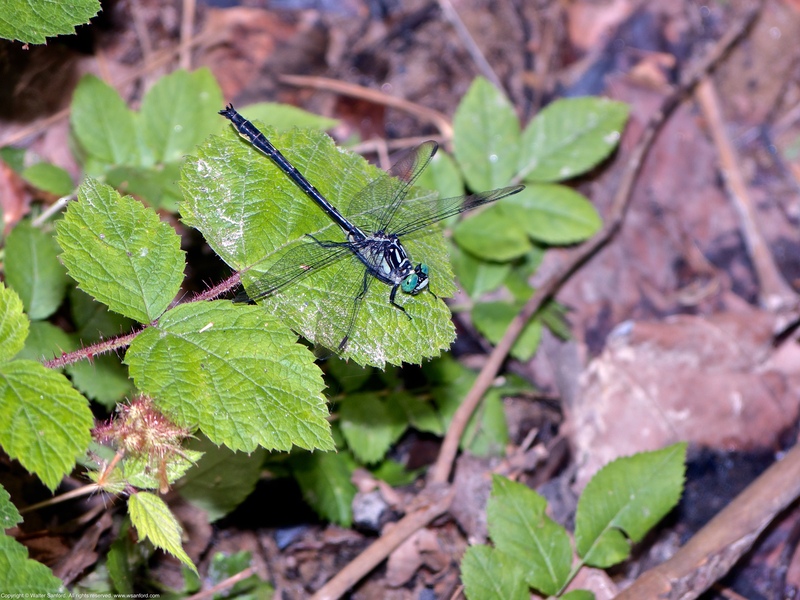 A Sable Clubtail dragonfly (Stenogomphurus rogersi) was spotted perched alongside a small forested stream located in Fairfax County, Virginia USA. This individual is a male, as indicated by his “indented” hind wings and terminal appendages. 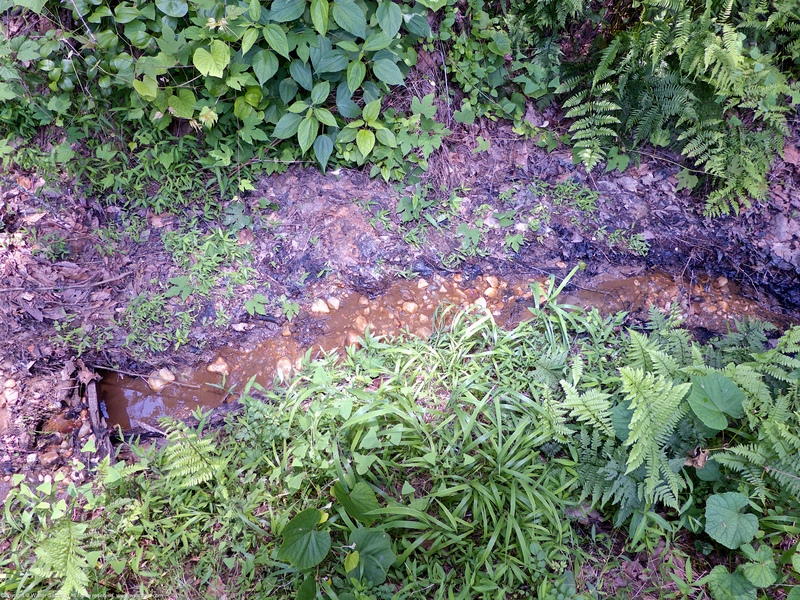 The following photo shows the lotic habitat in which Sable Clubtail lives. You’re looking down into the stream channel: the channel is a few feet deep; the stream itself is no more than a foot wide and a few inches deep. When I scouted the location during the off-season I recall thinking, “I don’t see clubtails coming from this tiny stream!” Once again I am reminded that dismissive thinking can be wrong-headed. 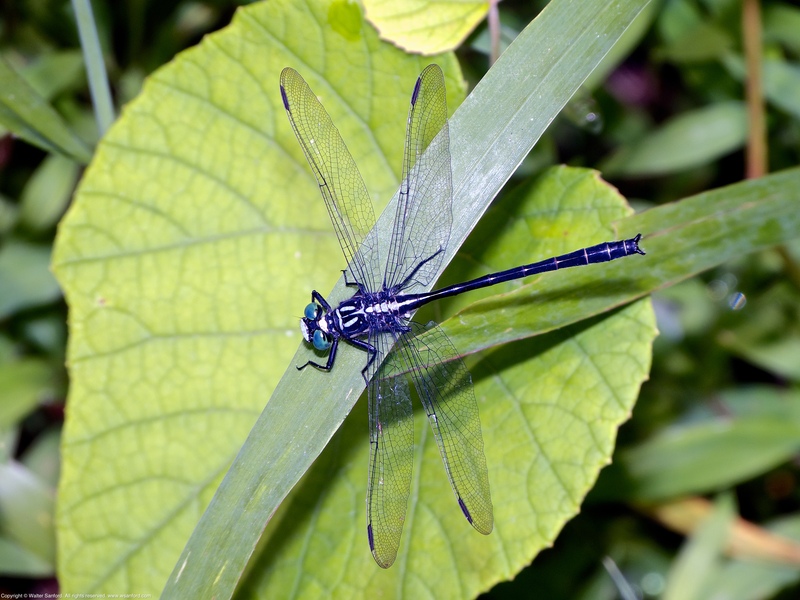 Sable Clubtail has a limited range and is classified as a rare to uncommon species of odonate. 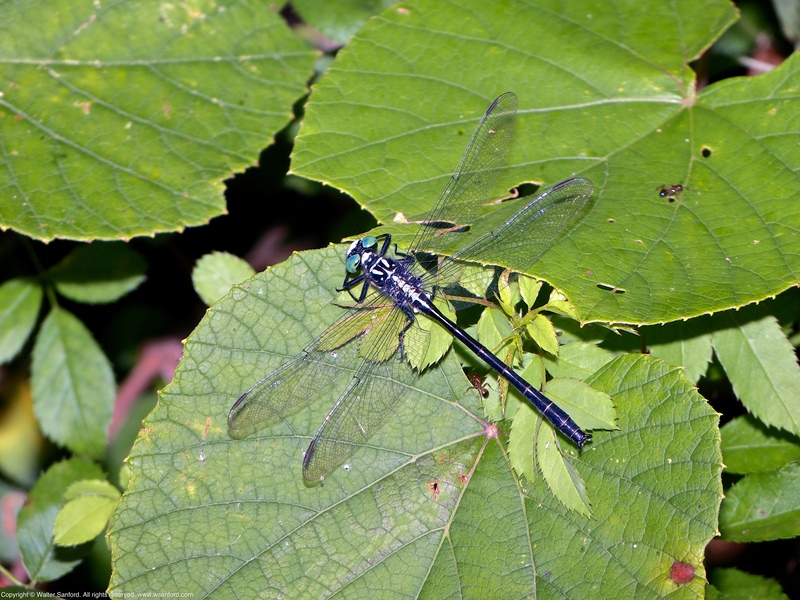 It is a prized addition to my “life list” of dragonflies! The following map shows all official records for Sable Clubtail in the United States of America.